The King of Pop’s little girl is stepping out of her late father’s shadow. 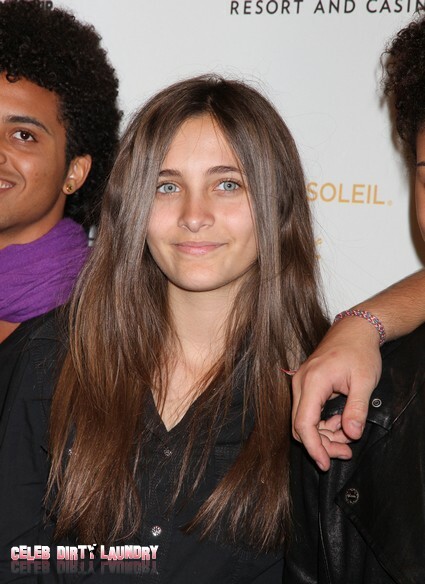 This week 13 year old Paris Jackson will appear on her first TV chat show. She’ll be Ellen’s special guest on Thursday, December 8. It’s a far cry from the toddler who was forced to wear elaborate masks by her Dad to keep her identity hidden. The main reason Paris has agreed to appear on the popular program is to promote her upcoming movie. The teenager is starring in a film called ‘Lunden’s Bridge and the Three Keys’. It’s about a young girl who saves the planet so her famous father would approve of the environmental message. The flick is based on the book by Dennis H. Christen. Acting runs in the family. Michael made several movies including The Wiz and Captain EO. Janet made a name for herself in TV classics like Good Times and Diff’rent Strokes. She then moved on to the big screen with Poetic Justice and Nutty Professor 2. Paris is bobbing up more and more these days. Last week she was in the X Factor USA audience to watch the contestants sing a medley of Jackson favourites. In October she appeared alongside her brothers Prince Michael and Blanket at the Michael Jackson Tribute Concert in Cardiff, Wales. While Oprah paid her a visit late last year to check in on the family 18 months after the singer’s shock death. The Californian school girl is coming out of her shell on social media as well. She often tweets about school, her friends and favourite music.